Jakobshavn Isbræ, Greenland’s fastest flowing glacier, has been moving even faster over the past several years. The Jakobshavn Glacier, or Jakobshavn Isbræ, is located on the west coast of Greenland and drains a major part of the Greenland ice sheet into a deep ocean fjord. Accordingly, the Jakobshavn Glacier could add significantly to sea level rise. We have extended the record of flow speed on Jakobshavn Isbræ through the summer of 2013. These new data reveal large seasonal speedups, 30 to 50% greater than previous summers. At a point a few kilometres inland from the terminus, the mean annual speed for 2012 is nearly three times as great as that in the mid-1990s, while the peak summer speeds are more than a factor of four greater. 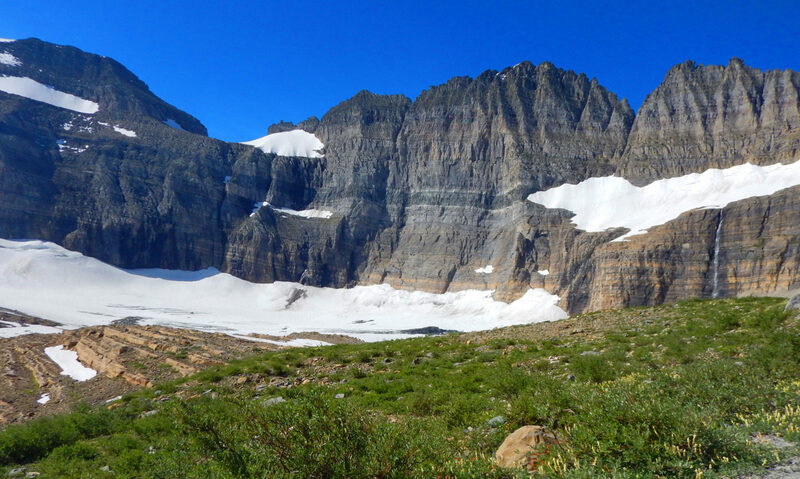 These speeds were achieved as the glacier terminus appears to have retreated to the bottom of an over-deepened basin with a depth of 1300m below sea level. The terminus is likely to reach the deepest section of the trough within a few decades, after which it could rapidly retreat to the shallower regions 50 km farther upstream, potentially by the end of this century. The warming trend in the Arctic correlates with Greenland’s glaciers thinning and retreating progressively inland. The rapid retreat of the Jakobshavn Isbræ, however, is due not only to the warming trend, but to a number of feedbacks. The primary control on the glacial flow now is the physical location of the glacier’s calving front. The calving front is currently located in a deep area of its outlet fiord, an area where the underlying rock bed is about 1300 meters below sea level. As the glacier loses ice in this area – basically the ice in front that is holding back the flow – the flow speeds up. We know that from 2000 to 2010 this glacier alone increased sea level by about 1 mm. With the additional speed it likely will contribute a bit more than this over the next decade. Thus, the potential for large losses from Greenland is likely to be determined by the depth and inland extent of the troughs through which its outlet glaciers drain. These features are only beginning to be well resolved by international efforts such as NASA’s Operation IceBridge. The relatively sparse data collected thus far indicate that, with its great depths and inland extent, Jakobshavn’s Isbræ is somewhat unique (Bamber et al., 2013), suggesting that it may be difficult for the majority of Greenland’s outlet glaciers to produce or to sustain such large increases in ice discharge. Of interest may be an earlier Geopostings on “Chasing Ice” that showed a 2012 huge calving event from the Jakobshavn Isbræ. The Intergovernmental Panel on Climate Change‘s (IPCC) much awaited report, the Fifth Assessment Report (AR5), concludes that scientists are 95% certain that humans are the “dominant cause” of global warming since the 1950s. A policy makers’ summary for AR5, IPCC’s latest report on physical evidence for climate change, was released today. The full report will be released on September 30th. Human influence on the climate system is clear. This is evident in most regions of the globe, a new assessment by the Intergovernmental Panel on Climate Change (IPCC) concludes. since the mid-20th century. The evidence for this has grown, thanks to more and better observations, an improved understanding of the climate system response and improved climate models. assessment report, Climate Change 2013: the Physical Science Basis, approved on Friday by member governments of the IPCC in Stockholm, Sweden. “Observations of changes in the climate system are based on multiple lines of independent evidence. Our assessment of the science finds that the atmosphere and ocean have warmed, the amount of snow and ice has diminished, the global mean sea level has risen and the concentrations of greenhouse gases have increased,” said Qin Dahe, Co-Chair of IPCC Working Group I.
more frequently and last longer. As the Earth warms, we expect to see currently wet regions receiving more rainfall, and dry regions receiving less, although there will be exceptions,” he added. Projections of climate change are based on a new set of four scenarios of future greenhouse gas concentrations and aerosols, spanning a wide range of possible futures. The Working Group I report assessed global and regional-scale climate change for the early, mid-, and later 21st century. The International Energy Agency just released a new report that shows how energy efficiency of urban transport systems could facilitate savings of up to USD 70 trillion that would be spent on vehicles, fuel and transportation infrastructure from now until 2050. The report, A Tale of Renewed Cities, draws on examples from more than 30 cities across the globe to show how to improve transport efficiency through better urban planning and travel demand management. Extra benefits include lower greenhouse-gas emissions and higher quality of life. The report comes at a critical time: More than half of the world’s population already lives in cities, many of which suffer from traffic jams and overcrowded roads that cost hundreds of billions of dollars in lost fuel and time and that harm environmental quality, health and safety. Climate records from Siberian caves suggest an impending permafrost thaw and a resulting global warming acceleration. Permafrost regions cover 24% of the northern hemisphere land surface, and hold an estimated 17,000 Gt of organic carbon. Thawing releases CO2 and CH4, creating positive feedback during greenhouse warming. The researchers, led by Gideon Henderson at the University of Oxford’s Department of Earth Sciences, studied speleothem records from the caves to identify periods where temperatures were above freezing. Speleothems, such as stalactites and stalagmites, form when water seeps through cracks in cave walls, dissolving minerals which precipitate in the air filled cave. By dating the speleothems and comparing their ages to existing climate records, it is possible to identify the degree of warming which caused the permafrost to melt. New results from Ledyanaya Lenskaya Cave, Eastern Siberia, extend previous records to one million years, and show major deposition of speleothems at around one million years and 400,000 years ago. Global temperatures are currently around 0.7 degrees above pre-industrial level, with current models suggesting that a warming of 1.5°C ± 0.5 will be achieved within 10-30 years. As Congress continues to stonewall on climate change legislation, I think that a recent article published in the Perspectives section of Nature Climate Change, The impacts of climate change on terrestrial Earth surface systems, is worth contemplating. The authors, Jasper Knight and Stephan Harrison, argue that “… at present, governments’ attempts to limit greenhouse-gas emissions through carbon cap-and-trade schemes and to promote renewable and sustainable energy sources are probably too late to arrest the inevitable trend of global warming. Instead, there are increasingly persuasive arguments that government and institutional focus should be on developing adaption policies that address and help mitigate against the negative outcomes of global warming, rather than carbon trading and cataloguing greenhouse-gas emissions”. Don’t think that the authors suggest for us to just walk away from the greenhouse-gas emission and global warming problem, though. What they are advocating is a more inclusive strategy for dealing with global warming, one that includes understanding and managing the impacts of climate change on the dynamics of Earth surface systems – systems that include glaciers, rivers, mountains and coasts. These systems supply resources such as soil and water, and as such are critical components to life on earth. And, as we just witnessed with Superstorm Sandy, some of these systems, such as coastal and river systems, are vital in alleviating the impact of catastrophic weather events. The major problem with immediately incorporating earth surface system data into a global warming management response is that earth surface systems operate on a much longer time scale than elements of the biosphere. To mitigate the time dilemma, there is potential in looking at earth surface system responses to past climatic events. Knight and Harrison note that, “…for instance, climate cooling during the Little Ice Age in Europe (~ad 1550–1850) had significant impacts on the sediment yields of mountain, fluvial and slope systems, particularly in marginal regions already predis­posed to be climatically sensitive to changes in temperature and pre­cipitation patterns, including their seasonality”. In any event, currently, most Earth surface systems are not regularly monitored regarding climate change. This is a huge policy omission, both nationally and internationally, because Earth surface system dynamics are a major part of the landscape response to climate change, and these systems function on multinational spatial scales that play into sustainable resource management. It is going to take a large-scale effort by scientists, governments, and most importantly, citizens to make sure that the response to global warming includes understanding and managing the impacts of climate change on the dynamics of Earth surface systems. It’s long past time to get to work. 2 Degrees Celsius – An Inevitable Global Average Temperature Increase? The Global Carbon Project’s recent analysis on current carbon dioxide emissions published in the latest issue of Nature Climate Change underscores the necessity for action in emission reduction. The commentary’s authors concluded that the rapid growth in fossil fuel emissions makes a global average temperature increase of 2 degrees Celsius (3.6 degrees Fahrenheit) inevitable. It is this 20 Celsius global average surface temperature limit that was agreed to during the 2009 United Nations Climate Change Conference in Copenhagen, Denmark. And it is the goal of the in-progress 18th annual United Nations climate-change summit in Doha to create a world treaty, which would be signed in 2015, to slow global green-house gas emissions so that global average surface does not rise by 20 Celsius. The commentary’s abstract is found at Nature Climate Change – The challenge to keep global warming below 2 °C.